My husband and I traveled to Granada, Nicaragua with some friends this past May. Not only was the country beautiful…but the food was delicious! One of our favorite things to do late-night, after a few Tonas, was to hit the street food vendors and load up on a variety of foods…from tacos to empanadas to Nicamales, the Nicaraguan Tamale. 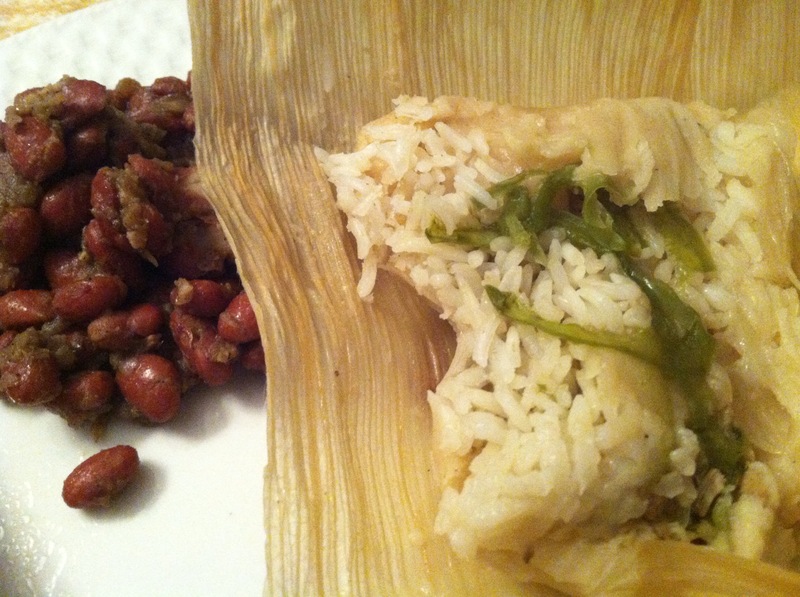 What makes the NicaMale different from a regular tamale is the size, they are huge! Traditionally, they are wrapped in a large banana leaf and filled with meat and rice. We stayed in a home in the heart of Granada, and one morning, our housekeeper made NicaMales for breakfast. They were savory packages filled with chicken and rice and served with a little hot sauce. I knew I had to recreate them at home! Unfortunately, I was unable to find banana leaves in Atlanta. So I had to settle for dried corn husks, which were also difficult to find. (If you live in Atlanta, they’re at the Buford Highway Farmer’s Market.) I filled the husks with the traditional masa mixture, pulled pork with tomatillo sauce, rice and thinly sliced Vidalia onions and green bell peppers. They came out perfect! One thing to note, is it’s a lot easier to make these with a few extra hands, so teamwork is key. My hubby made the dough and we worked together to fill, fold and tie them (an art in itself). Also, realize that these babies steam for about three and a half hours, so preparing them is an all day affair (I prepared the pork the night before in the crockpot)…but definitely worth it! Place the masa harina, lard and salt in the bowl of an electric mixer. You can also throw in a bowl and use a hand mixer. Blend on a low speed to incorporate the fat into the masa harina and give it a mealy texture. You may have to do this and the next step in two batches if your mixer bowl is not large enough to hold all the ingredients without overflowing. With the mixer still on low speed, add the orange and lemon juices and enough chicken stock to make a soft, moist dough. It should be a little firmer than mashed potatoes. Increase the mixer speed to medium-high and beat for 2-3 minutes to incorporate some air into the masa and make it fluffier. Cover the bowl and set the masa aside to rest for at least 30 minutes. Assemble all of your filling ingredients and assembly items on a large table or work surface. Gather family and friends to help in an assembly line. Lay out corn husks (or banana leaves). Place 1/2 cup of the masa in the middle of the corn husk and, using wetted hands, spread it out a little. Put about 1/2 cup of pork on top of the masa and sprinkle 1 or 2 tablespoons of rice over the pork. Top with about 4 pieces of onion and 4 pieces of pepper. Fold the top edge of the corn husk down over the filling. Bring the bottom edge up over this. Then fold in both sides to make a rectangular package. Be careful not to wrap it too tightly or the filling will squeeze out. Flip the package over so it is seam side down. Use a torn corn husk as a tie to hold it securely. Add 2 or 3 inches of water to a pot large enough to hold all the Nicatamales. (I used two pots since I didn’t have one large enough to hold them all. ) Place a rack or steam strainer in the bottom or toss in enough wadded up aluminum foil to hold the Nicatamales mostly out of the water. Add the Nicatamales and bring to a boil over high heat. Cover tightly, reduce heat to low and steam for 3 to 4 hours. Add more water as needed to keep the pot from boiling dry. Remove the Nicatamales from the pot and serve hot. Each diner unties the corn husk on his or her own Nicatamal before eating. These were delicious served with Gallos Pintos (recipe coming soon). Let’s hit the pavement this Sunday in search of the best street food from around the globe! Join us for a #SundaySupper event featuring Global Street Food that we’ve made in our own kitchens, in honor of our favorites and/or those we would love to try! If you are brave enough to slice up three pounds of this season’s especially pungent onions, this soup will be well worth your tears. A great beginning to any dinner, or enjoyed in a mug, curled on the couch watching really bad tv. Melt together the butter and olive oil in a large stockpot. Crush and peel the garlic. You don’t have to mince it; it will caramelize and turn soft and sweet as it cooks. Caramelize the garlic in the olive oil and butter. Pour in the onions, season with salt and pepper, and stir around just until the onions are all coated in the olive oil/butter. Add in the fresh thyme and the bay leaf and let the onions caramelize, about 20 minutes. Once the onions are caramelized and have cooked down, pour in the stock, about 4-6 cups depending on whether you prefer your soup more onion-y or more soup-y. Then, pour in the beer and simmer, uncovered, for at least an hour and as much as three hours, tasting occasionally to adjust the flavors. Meanwhile, slice down your bread. Stale bread is perfectly okay for this, just heat it up a bit in a warm (250ºF) oven first to soften it. Toast the bread; you can rub both sides with a cut clove of garlic first, if you like. You’ll want 2 pieces of bread per person – one for the bottom of the bowl, and one for on top. Grate together about 1/2 cup each of parmesan, gouda, and mozzarella and set it aside. Preheat your broiler. Remove the thyme sprigs and bay leaf from the soup. Arrange your oven-safe individual serving bowls or coffee mugs on a baking tray with a thin lip. TO SERVE: drop a toast slice in the bottom of each bowl. Ladle in the soup and cover with a second slice of toast. Then cover the toast with cheese. Be generous! You want the cheese to seal in the soup and drape over the edge of the bowl. Broil for a few minutes, until the cheese is brown and bubbling on top. Garnish with a little fresh thyme, and serve. 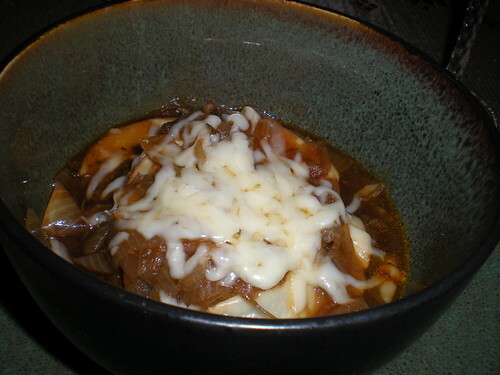 I used this beef stock in what resulted in the richest French Onion Soup I’ve ever had. Animal bones and meat naturally have some sodium, so adding salt isn’t necessary. Preheat oven to 425 degrees. Rinse the bones with cold water and pat dry. 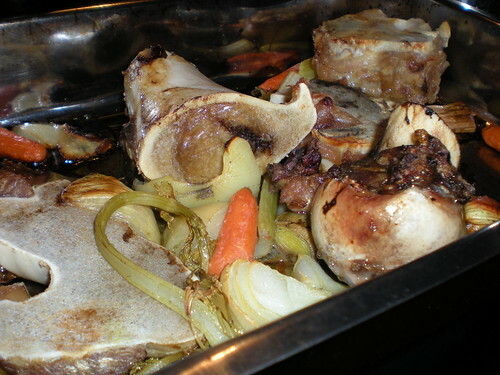 Place the vegetables in a single layer in a large roasting pan and add the bones on top. Roast, turning the bones a few times, until well browned; about 1 hour. Strain stock and discard solids. Cool and then refrigerate overnight. The following day, remove and discard fat that has risen to the top, and discard any debris that has sunk to the bottom. Salt before using or, if planning to reduce, wait to add salt until later. Can be stored in the refrigerator for several days, or divided into smaller quantities and frozen for future use, up to 6 months. I had some left over broccoli after making Knishes and thought Broccoli Cheese Soup would be delicious in the cold weather — it was perfect. The hot, creamy soup will definitely be making it to my winter rotation — especially with the spicy croutons! Your family will thank you for the hearty wholesome meal. In a medium pot, melt the 3 tablespoons butter over medium-high heat. Add the onions, salt, pepper, and nutmeg and cook, stirring, until soft, 3 minutes. Add the garlic and thyme cook, stirring, until fragrant, for 20 seconds. Add the flour and cook, stirring until the mixture is well blended and smells fragrant, 2 minutes. Slowly add the chicken stock, whisking constantly, and bring to a boil. 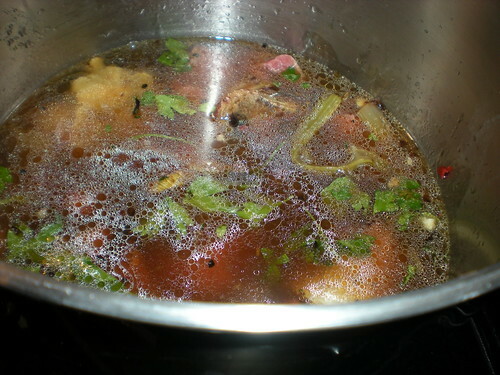 Reduce the heat and simmer until thickened, about 5 minutes. Add the broccoli and cook, stirring, until tender, for 10 minutes. Add the cream and bring to barely a simmer to heat through. Add the cheese and cook over low heat, stirring, until melted. Add the remaining 2 tablespoons cold butter, stirring to blend. Remove from the heat and ladle the soup into bowls. 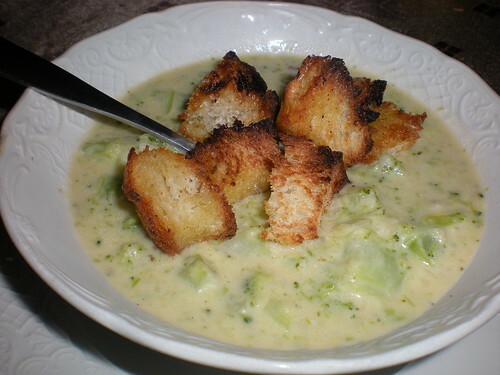 Sprinkle croutons over the top of the soup and serve immediately. Place the bread in a medium bowl and toss with oil and Essence. Spread evenly on a small baking sheet and bake, stirring twice, until light golden brown on top, about 6 minutes. Remove from the oven and cool slightly before serving.